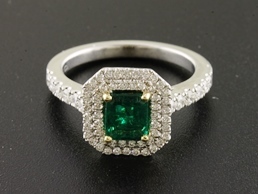 A lush green emerald is nestled in a floating double halo of shimmering white diamonds. 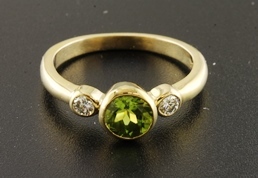 This peridot has the hue of the just opened leaves of Spring. The diamonds are drops of dew. This ring has a fresh and funky look. 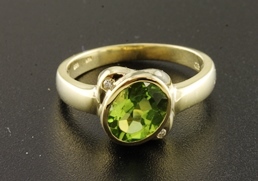 The peridot is set at a slight angle with a small diamond accent above and below. 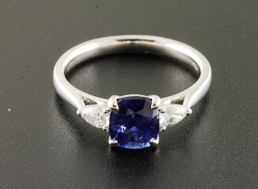 The sapphire in this ring is the deep and penetrating blue of a high mountain lake. 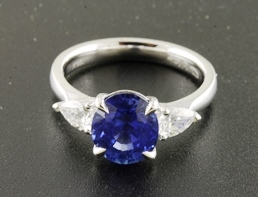 A pear shape sapphire on each side is just the right sparkling accent. A glowing sapphire set at the center in four prongs has a pristine pear shape white diamond gently kissing it on either side. This ring has an organic look and sits very comfortably on the finger. 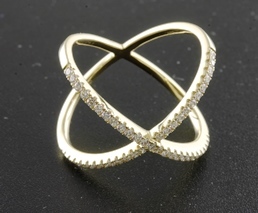 The three bands of diamonds add a nice flash to the brushed gold. 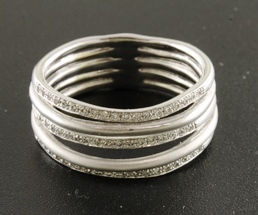 A very hip and contemporary ring for the modern woman! 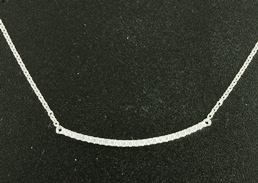 The unique design of this piece is pleasing to the eye. A timeless addition to any collection. This pendant has a contemporary flair. Great for the office or the weekend. Let her know your heart belongs to her! 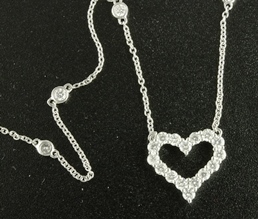 This shimmering diamond heart suspended from a diamonds by the yard chain says it all! Just the right earring for day or night! 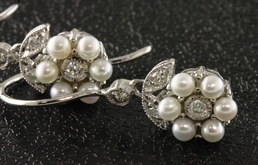 Lustrous cultured pearls paired with diamonds in 14kt white gold have a vintage flair. 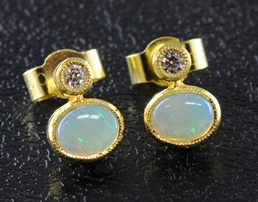 The lovely luminous shimmer of opals accented by the brilliant flash of diamond!